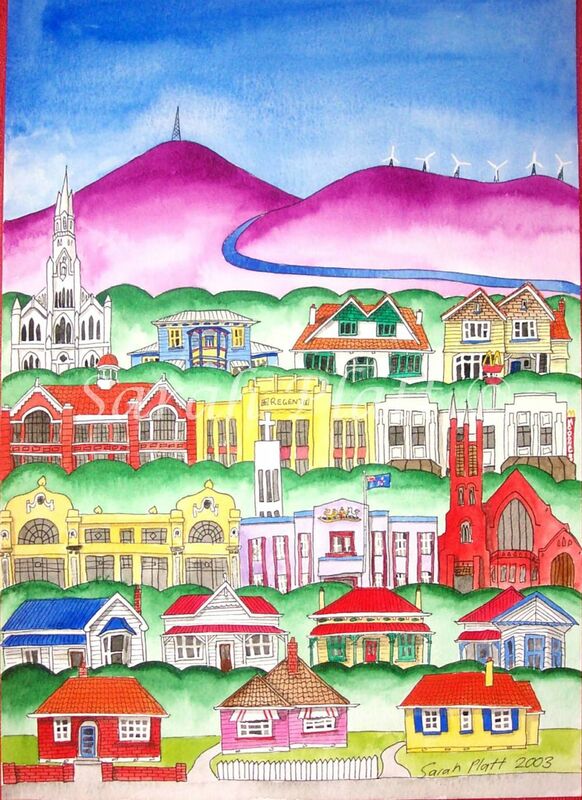 This is a wee painting I did for Carncot School in 2003 as a fund raiser for an art auction they held at Te Manawa Art Gallery. It was the first wee A3 painting I ever did and my first limited edition print run. Creating limited editions was new territory for me, and I still remember my husband and I deliberating over how many to make. We decided on 100. They sold out within the first year or two. I have made many limited editions of towns since that time in this size. It seems people are confident to buy this size for gifts for friends. It’s big enough to be special but small enough to feel confident that it won’t dominate a room. Back then offset printing was the most affordable option for me, which gave me a great choice of paper to print on. However it was limited in its colour intensity and fade resistance. It’s a far cry from the fine art prints I’m producing today which while very expensive to produce are the crispest of images and archival quality with inks guaranteed not to fade for up to 200 years.